Sara Sampson is currently the Deputy Director of the Law Library at University of North Carolina at Chapel Hill. 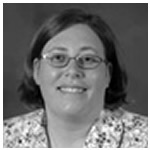 Sara has also worked at Georgetown University as the Head of Reference and an adjunct professor and at Ohio State College of Law as a reference librarian and adjunct legal writing professor. Sara received her J.D., with honors, from Ohio State University and her M.L.I.S. from Kent State University and is a member of the Ohio bar. Through the years, she has taught: Legal Research, Advanced Legal Research, Legal Writing and Analysis, Introduction to Scholarly Note Writing, and Legal Research Skills for Practice. Sara writes in the areas of legal research and library services. A full list of her publications is available at http://www.ll.georgetown.edu/faculty/pubs.cfm?id=167. Sara is actively involved in library professional organizations. She chairs the Research and Publication committee of the American Association of Law Libraries (AALL) and serves on the Program Committee for the Academic Law Libraries section of AALL (ALL-SIS). She has previously served as the Vice President of the Law Librarians’ Society of Washington, DC, the Secretary/Treasurer of ALL-SIS and chaired several committees for ALL-SIS: the Archives and Website Committee, the Programs Committee, and Faculty Services Committee. She has also served as editor of LLSDC’s Law Library Lights. Before becoming a librarian, Sara spent five years as a judicial law clerk at the Ohio Fourth District Court of Appeals.